Honorable Mention in Darkroom Gallery Contest! One of my images has won Honorable Mention in the monthly contest Nocturne held by the Darkroom Gallery in Essex Junction, Vermont. The Darkroom Gallery is a northern Vermont based gallery dedicated to recognizing photographers and exposing their work to the public. They host juried exhibits providing opportunities for photographers from around the world to have their work evaluated by qualified jurors for display in their gallery. The Darkroom Gallery hosts monthly exhibits in their gallery with images selected by an independent juror each month. This is the second time I’ve felt I had an image that was ideal for the theme of a Darkroom Gallery contest, and thus the second time I have entered one of their contests. I’ve won both times under different jurors, the previous time with my image House of Blue for their Color Story theme, which I wrote about here back in 2013. This time the theme was Nocturne. The idea was to present “nighttime imagery that conveys mystery, surrealism, isolation, loneliness, and time/timelessness”. Well, I can’t think of anything more mysterious, surreal, isolated, lonely, and timeless than standing in the middle of a frozen lake by myself for hours in the middle of the night watching a lunar eclipse take place under a sky filled with the eerie antics of the Aurora Borealis. 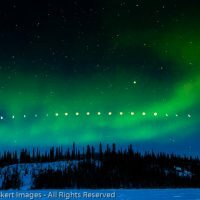 Apparently juror Lance Keimig agreed, awarding me Honorable Mention, or what amounts to 2nd Place, for my image Lunar Eclipse and Aurora Borealis. Here are the top three images from the contest. Click on the image to see the entire set of 56 images chosen from among the 630 entries. The exhibit opens on September 17th and runs through October 11th. Also, a reception will be held on Friday, October 2nd to honor the winners. And, it just so happens that I’ll be in the New England area during that time! So unlike the last time I won, when a massive February winter storm shut down the East Coast, this time I’ll be able to be there! I love it when a plan comes together! So, if you find yourself somehow in the Burlington, Vermont area on the weekend of October 2nd, come by and say Hi! I’d love to see you!